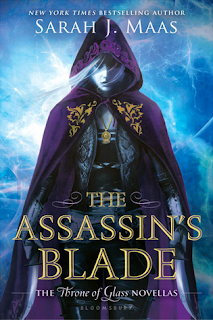 Assassin's Blade is a collection of five novellas that take place before the book Throne of Glass, about assassin Celaena Sardothien before she was captured and sent to the prison at Endovier (which is where ToG begins). Individually, they were released immediately after ToG in 2012 (though the collection was finally released in 2014), so as long as you've read ToG, even if you haven't read the rest of the series, you're good. If you haven't read any of them, then spoiler alerts for you! At sixteen, Celaena is the protege of King of Assassins, Arobynn Hamel. She's the best assassin in the entire guild, notorious for her skill and arrogance. Second to her is Sam Cortland, whom she has known and worked with her whole life, and though they are rivals, he is also the person she trusts the most and he eventually also becomes the man that she loves. But as we know from ToG, things do not end well for Celaena and Sam - we know that something happens that causes Arobynn to beat her to a pulp, and we know that, in a job gone wrong, Sam gets captured and tortured and killed, and that someone sets up Celaena as well, and in the end, she too gets captured, turned in to the King of Adarlan, and then sent to Endovier. - "The Assassin and the Pirate Lord" details how Celaena and Sam are sent on Arobynn's behalf to discuss business with the Pirate Lord, Rolfe. When they learn that Arobynn has lied to them and that this "business" is actually Arobynn buying into the slave trade, Celaena refuses to be a party to it, and sets out to free all the slaves. With Sam's help, she does so successfully. It's the only story where Celaena is not... broken. This is Celaena at her finest, her sassiest, her most confident. - "The Assassin and the Healer" finds Celaena on her way to... somewhere. She's in a random tavern in a random town, waiting for a ship that will take her to the next place Arobynn is sending her. She's badly injured - she has a black eye and a split lip, and her body and face are a map of bruises. There's a current of anger running under her skin, and there's no mistaking the air of danger that surrounds her. Celaena unleashes her rage upon a group of mercenaries who show up to the tavern and in the process, helps the barmaid find her inner strength as well. - "The Assassin and the Desert" tells about Celaena's time training with the Silent Assassins in the Red Desert. After her stunt with the Pirate Lord had cost him a great deal of money, Arobynn had beat her unconscious, and then sent her to the Silent Assassins, demanding that she return with a letter of approval from the Mute Master or that she leave his guild. There's quite a contrast between the cutthroat life with Arobynn's guild and the peaceful atmosphere of the Silent Assassins. This is one of the "adventures" that Celaena alludes to in ToG, so we get to hear about her time training with the Master, as well as the story behind that time she stole an Asterion mare (rare, special, worth LOTS of money) from the local lord. It's a romping adventure, punctuated with solemn moments of reflection and worry about the life that awaits her at home with Arobynn and about whether Sam is even still alive after also being punished by Arobynn. After saving the Master's life in an attack, Celaena is sent home with her letter and enough gold to pay off her debt to Arobynn. - "The Assassin and the Underworld" is Celaena's homecoming, and it was in this story that you get the full sense of how Kill Bill their relationship is. We're used to seeing Celaena being the powerful one, but when we see Arobynn's style of manipulation, we fear for her. He apologizes to her for beating the crap out of her, claiming that he just doesn't know how to deal with his emotions, and even Celaena starts to say that even though she still believes she did the right thing freeing those slaves, she had betrayed Arobynn with her decision, and that hurt was what was behind his beating. It's like she almost very nearly apologizes for him. There are a lot of scary, gross people of questionable morality that Celaena has to deal with over the entirety of the series, but I think Arobynn has got to be the worst, because he is her abuser. We hear about the beating and other violent, tough-love methods he employs to teach her lessons in the other ToG books, but hearing his apology to her and seeing him try to win her forgiveness by buying her expensive gifts just feels that much worse. It made my skin crawl. Celaena almost falls for it when she realizes that he has lied to her yet again about a job he has sent her on, and that is what finally makes her decide to part ways with Arobynn. She finally decides to buy her freedom, and selling the Asterion mare, she buys Sam's freedom as well, as they both realize that they love each other and they want to start a life together. - "The Assassin and the Empire" is the final novella, and the hardest one for me to read. I really dreaded reading it, but I didn't want to leave the book unfinished, so I soldiered on, knowing how the story was going to end. Celaena and Sam are finally together, but they have to take on one more job in order to finally buy their way out of the guild and move away to another continent - the assassination of Ioan Jayne, the local crime boss, and his second-in-command, the sadistic Rourke Farran. At Sam's urging, Celaena agrees to let him take out Farran alone, and then together they will kill Jayne. But when Sam doesn't come home, and Celaena finds Arobynn waiting for her at her (not so) secret apartment, she realizes something is wrong. Sam's body is at the Assassin's Keep, mutilated almost beyond recognition at the hands of Farran. Heartbroken and numb with rage, she sets out for revenge, managing to kill Jayne before she is captured by Farran and his men: it was a set up. It had all been a set up, to get her to kill Jayne so that Farran could advance, and in the process, to kill Sam and turn over Celaena to the King of Adarlan for granted immunity. Celaena gets sent to Endovier, to maximize her suffering, rather than being hung or beheaded. When Farran asks him why he did it, Arobynn replies, "Because I don't like sharing my belongings."